Sri City, January 26, 2016:- The 67th Republic Day was celebrated with enthusiasm and zeal in Sri City. 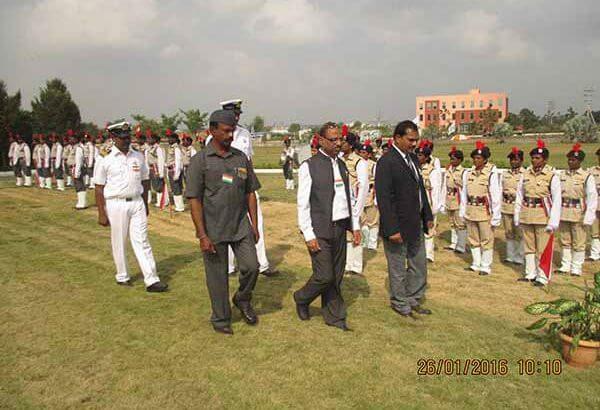 In a colourful ceremony held at the lawns of Business Centre Mr. Anil K Choudhary, Development Commissioner unfurled the National Flag, and took salute in an impressive parade held by the contingents of Sri City Security force. Addressing the employees, Mr. Choudhary said that in a short stint of time Sri City emerged as one of the largest SEZs in the country, and it is immensely benefiting the people in the region by creating employment opportunities. Mr. Sriniraju, Chairman, Mr. Ravindra Sannareddy, Managing Director, Sri City, Sri City, Mr. Ramesh Subramaniam, President, Sri City Foundation, Mr. P. Mukund Reddy, Director, Sri City, Mr. Shaik Altaf, General Manager, Security & Vigilance, and a host of dignitaries from the industrial units and a large number of employees took part in the event.